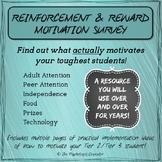 Motivation Survey - find out what ACTUALLY motivates your toughest students! I have students fill this out with me when students have a hard time communicating their thoughts and feelings. This a good way for teachers to see what motivates them which could help them with incentives or their behavior. Reader Interest & Motivation Survey ~ Bilingual! The document includes two versions of a reading and writing engagement/motivation survey. I like to use this survey towards the beginning of the school year to get a better idea of how my students see themselves (and/or how their parents view their children) as readers and writers. Wondering why your students are struggling in reading? Start off by giving them a reading motivation survey to find out their general feelings and attitude towards reading! Scoring guide included! This is a great tool to help you get to know your students, and allow you to better motivate them! It can also serve as a great sub plan! A detailed survey used to determine math motivation in middle school or high school students. This survey is designed to use at the start of the period on the first day of school to help you get to know your students better. Questions listed are meant to help you gain insight on what motivates student learning. Student Interest Survey - Get to Know Your Students! 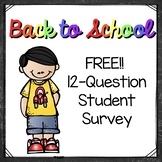 This simple, 10-question survey can be used to get to know your students quickly and easily.